An inmate who escaped from a prison vehicle while being transferred between jails has handed himself in. Phillip Barrett made his getaway on the M32 while being transported to HMP Bristol at about 14:40 GMT on Thursday. 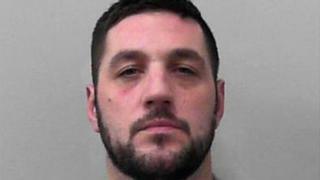 Barrett, 37, who has links with South Bristol was arrested after handing himself into a police station. Avon and Somerset Police thanked the public for their help and confirmed he walked into a police station in Bristol at about 11:00. Barrett has been convicted of a number of offences including battery and possession of an offensive weapon.